My Favourite Books of All-Time! It’s time for my first weekly wrap up of 2016! Firstly, I’d like to take the time to say a huge thank you to everyone who has helped and supported me as I found my feet in the book blogging world, I am more grateful than I can say. Starting this blog was one of the best things I did in 2015. I never expected that people would read my reviews or follow my blog, and I never knew that I would make genuine friends as a result of becoming a book blogger. It’s really not an understatement to say that starting this blog has changed my life already. I last did a weekly wrap up post on 19th December so I’m going to use this post to recap all that has happened since then. My reading pace has slowed down massively since I was poorly at the start of December. I’m still not 100% well and due to my physio schedule becoming more intensive I’m exhausted and in increased amounts of pain a lot of the time and reading is near impossible when I feel like that. As a result of illness I barely blogged in December and I’m not going to be back at full blogging speed for a while yet. I am planning to post regular posts from now on though, they just won’t be daily as they were before. My Christmas Novel Recommendations, where I shared my favourite Christmas reads of 2015. My Favourite Ten Books of 2015, which was so hard to compile as I’ve read so many great books this year. I also shared the 2015 Year in Review post that WordPress emailed to me. Yesterday, I posted about My Most Anticipated Books of 2016, where I shared some of the books I’m most excited about reading when they’re released this year. I’ve read five books (since 19th December) and have so far managed to review three of them, I hope to review the other two soon (click on the links below the images to read my reviews). 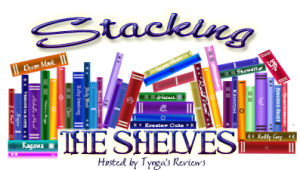 I’m also joining in with Stacking the Shelves (hosted by Tynga’s Reviews), which is all about sharing the books that you’ve acquired in the past week – ebooks or physical books, and books you’ve bought or borrowed or received an ARC of. For Christmas I received four books, which was fab! Three were from my husband and the fourth was a gift from the publisher HarperImpulse. HarperImpulse sent me a copy of Miracle at Macy’s by Lynn Marie Hulsman, which was a lovely surprise! This entry was posted in Book Meme, Books, ebooks, Stacking the Shelves, Weekly Wrap Up and tagged Ali Smith, Anna Smaill, Anne Enright, Ben McPherson, Books, Carmel Harrington, Carol Ann Duffy, ebooks, Eleanor Moran, Emma Bennet, Judy Blume, Kathryn Croft, Kelly Simmons, Louise O'Neill, Lynn Marie Hulsman, Mark Haysom, Melody Carlson, Natasha Pulley, Sue Perkins, Vanessa Diffenbaugh, Yusuf Toropov. Bookmark the permalink. All of these are new to me, but I hope you love them. Happy New Year! I received a copy of The Girl You Lost too. Just too late for my Stacking The Shelves post, though. I hope you enjoy all your books! It looks like such a good read. You’ll have to add it to your stacking the shelves post next week. Thank you, I can’t wait to read them all. Happy New Year to you too! Same here – I read most of her books as I was growing up and still remember my groups of friends passing around a copy of Forever at school! I really want to read Asking For It, sounds like such a good book! Looks like you had very busy week. I hope you enjoy all your new books this week. Wow what a terrific week(s), I have The Watchmaker’s Filigree on my tbr. Happy Reading!! I would like to read the Judy Blume book. I have such wonderful memories of her children’s books (and her teen book, Forever, was an eye-opener). Have a great week. I’m very keen to read it, I hope I can get to it very soon. I read all of her books as I was growing up too and, like you, remember reading Forever for the first time! Hope you have a great week too. I had a hard time compiling my Top Ten Favorites…but I finally did. Enjoy your new books…I am drawn to A Daughter’s Secret. Happy reading! It’s hard to pick ten books when you read a lot and have found so many great books over the year. I’m looking forward to A Daughter’s Secret, I’ll be reviewing it when I get around to reading it. Wow you’ve got a lot of books there. Funny I just bought In the Unlikely Event by Judy Blume this week as well. Happy reading to you. I hope you enjoy your new books. I’m really looking forward to reading it, I hope it’s good and that we both enjoy it. Happy reading to you too! Treated myself to After the Eclipse by Sarah Perry. I can’t wait to read this memoir, it’s been on my wish list for ages! My TBR for the 20 Books of Summer!